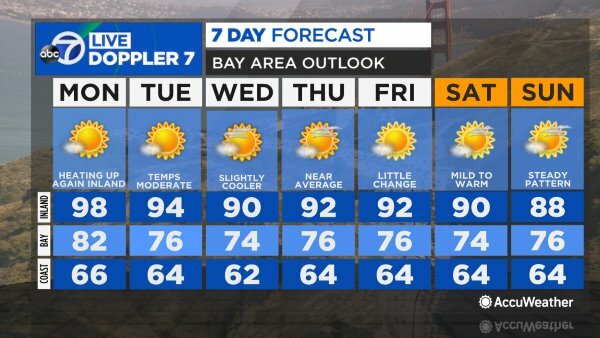 ABC7 News Meteorologist Mike Nicco has your local AccuWeather forecast for Monday. It's Monday again, but if you like warm weather you'll be happy. We begin this morning clear with microclimate temperatures. Most neighborhoods begin in the middle 40s to lower 50s but places like Antioch only cool into the upper 50s. Get the shades and sunscreen handy today. Burn time comes in at less than 15 minutes. Highs respond to the total sunshine by warming 5 to 15 degrees above yesterday's levels. Tonight features a clear sky a few small areas of fog possible in the North Bay Valleys and Peninsula Coast. Warmest day this year for most of the Bay and Inland neighborhoods tomorrow. Warmer than average temps reach or beaches also. Wednesday will one-up Tuesday as the warmest day this year.